Working with Smith this year is president-elect Steve Sonnenberg, manager of the DJ Sub Business Unit for EnCana Energy Resources Inc. in Denver. Sonnenberg, who became a member of AAPG in 1974, ran for the office because I believe in strong professionalism and that every member of a society should give back to that society. His goals for his future term in office include providing the right services to members and expanding public outreach for students. In order to help students visualize geology in motion, Tanya Atwater of the University of California, Santa Barbara, is working with undergraduate and graduate students to transform the mental cartoons geologists create of the world around them into visual concepts animated and distributed on the Web. Geologists see the world changing over time in their heads, whereas for most other people that view is static, she says. For this project, Atwater became one of six Distinguished Teaching Scholars to receive this years Directors Award from the National Science Foundation (NSF). The award of $300,000 over four years is given to help and honor distinguished scientists who are working out ways to translate research into education. The money is meant to provide teaching scholars the opportunity to expand their work beyond their institutions. 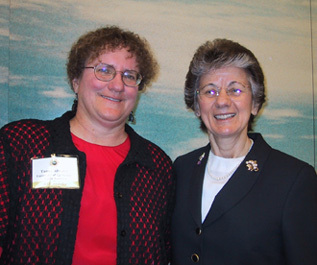 Tanya Atwater (left), standing with NSF Director Rita Colwell, is one of six teaching scholars to receive the NSF Director's Award. Photo by Christina Reed. Atwater is now asking geologists who want to animate the processes exemplified in their own local areas to come to Santa Barbara and work with us, she says. Well provide the computer expertise, the studio, the sound and video expertise and pay for living and travel expenses, Atwater says. In turn the geologists bring their maps, images and ideas. Already she has had geologists from Turkey, India and Chile expressing an interest in her offer. Atwaters team of students is illustrating continents and oceans as moving digital images, speeding up the element of time and presenting them as teaching resources on the Web and as videos for those without Internet access. Currently they have animations for western North America and southern California. Everything we produce slips into the digital libraries and becomes globally available, she says. Atwater is most well known for her work on the plate tectonic history of western North America, and specifically of the San Andreas fault system. She began animations of plate tectonics using the same technique as the early cartoons for television: by drawing and painting plastic cells and taking pictures of them one frame at a time. Her colleagues applauded her videos and encouraged her to continue. Then in the 1990s computer animation became friendly enough even for people like me, she says laughing. By bringing in geologists from different regions of the world, Atwater hopes to provide teachers around the globe with the tools to teach general geology with a local angle. My vision is for every schoolchild to be able to look out a window and understand the world, Atwater says. Atwater is a trustee of the American Geological Institute (AGI) Foundation and a member of AGIs Education Advisory Committee. She is also a fellow of the American Geophysical Union and the Geological Society of America.